Transformation and common parameters are available on the Node tab of the Parameters window. These parameters are common for all types of nodes and always available for editing. Specifies the position coordinates for the node. Specifies the rotation coordinates for the node. Specifies the scale factor for X, Y, and Z axes. The parameters can be set to default values by clicking right next to the fields with values. You can also copy and paste position, rotation, or scale as well as all transformation parameters together using the following context menu displayed by clicking right next to the fields with values. Math operations are available for spinboxes. Defines the node as a collider object, which means it is moved to a separate spatial tree for collision detection, optimising node management. The option should be enabled for all physically simulated objects. If a node doesn't participate in physics interactions, disable the option. The collision option can also be toggled on and off on a per-surface basis. More on enabling/disabling collision detection. Defines the node as a clutter object, which means it is moved to a separate spatial tree for immovable (static) objects optimizing node management. Indicates if the WorldSector and WorldPortal are used to determine the visibility of the node. If unchecked, the node is always visible. The option should be used for indoor environments. Enables occlusion query for the objects. The objects are tested whether their bounding boxes are seen. It allows reducing the number of rendered triangles, which is beneficial by using heavy shaders. This option provides the substantial performance gain when enabled for water or meshes with reflections. Enable this option only for a few nodes that use heavy shaders; otherwise, the performance will decrease instead of increasing. Culling will be performed if the hardware occlusion query test is enabled for the scene (the Rendering -> Features -> Additional Hardware Occlusion Culling flag is set). Enables interaction of the node with World Triggers. 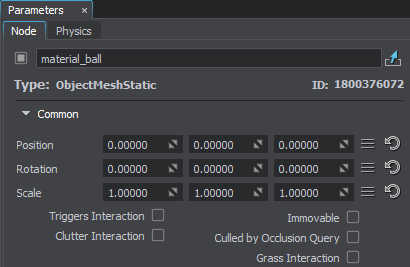 Enables interaction of the node (Object or Decal) with Grass. Enables interaction of the node (Object or Decal) with World Clutters and Mesh Clutters. Indicates that the node will be updated last. The option can be used to update some objects after others. For example, you can set the option for PlayerPersecutor attached to a node, to update it after updating the node to avoid camera jittering.